9114 Rare Charles Smith, Brattleboro, Vermont wall clock. 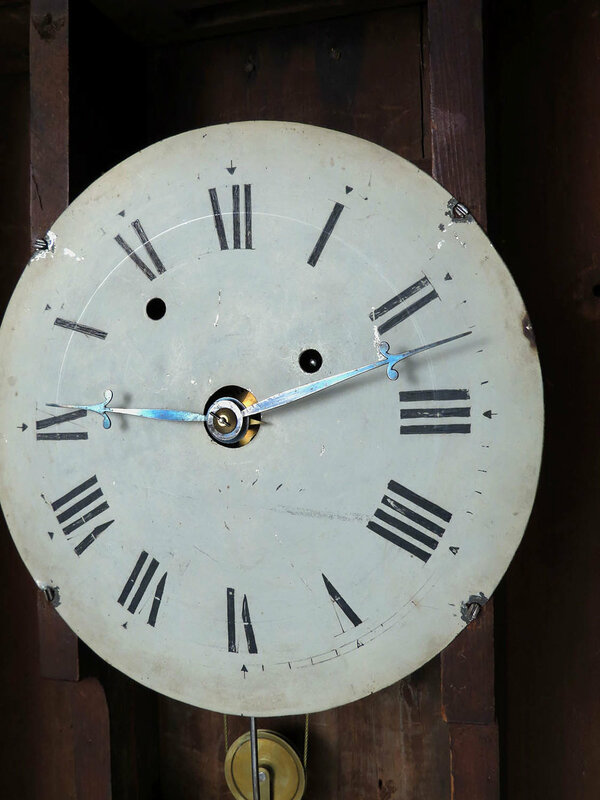 From 1931 to 1945 Charles Smith produced 614 clocks at his workshop in Brattleboro, Vermont. For those of you who have had the good fortune to have handled and examined one of these clocks firsthand, you will know what unique and exceptional examples of craftsmanship they are. 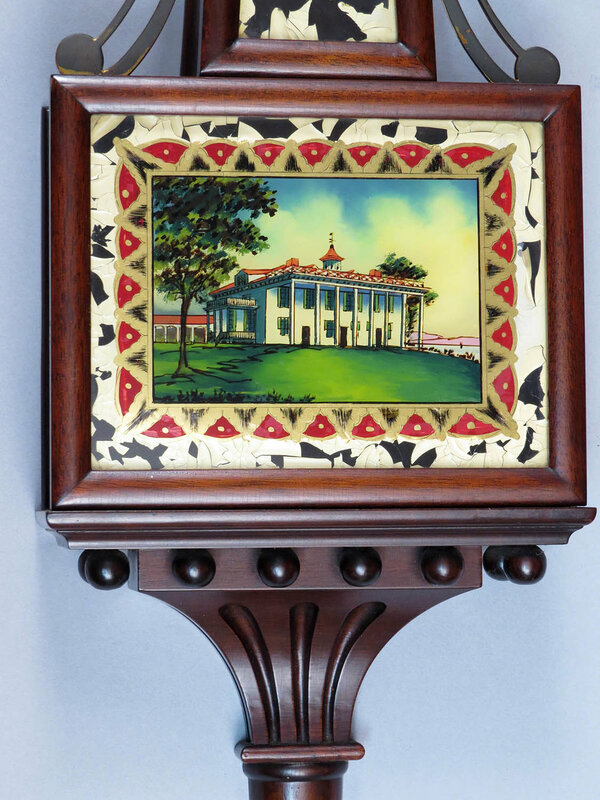 Charles Smith’s precision and attention to detail are evident in every aspect of these clocks. 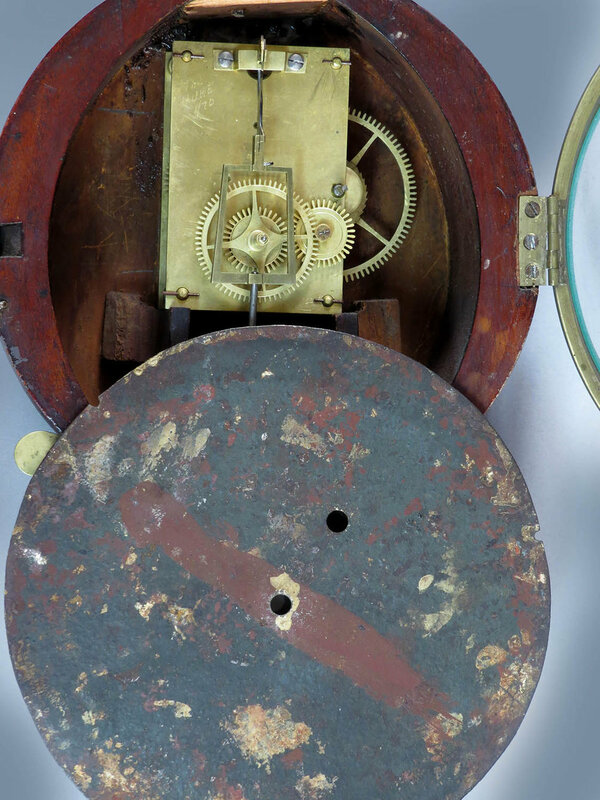 From the movement to the dial, hands, weight, pendulum etc., virtually every piece of this clock was handmade by Charles Smith in his workshop. 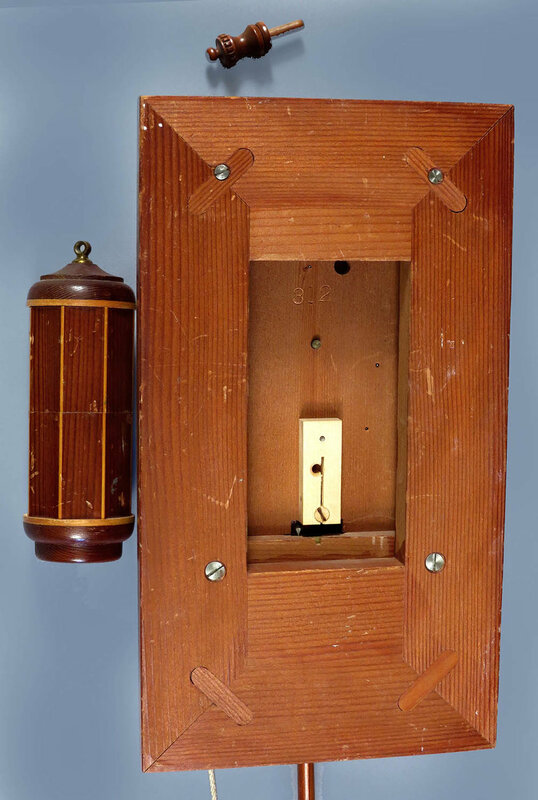 Smith was always experimenting and producing clocks with different styles and types of wood. This particular model is probably redwood with maple and ebony inlay. There are two items that need to be pointed out. The first is that there is some finish scuffing on the weight and pendulum rod and the second is that the wooden counterweight is missing. This is a 30-hour wooden works weight driven timepiece. It does have the original distinctive wall mounting bracket which is often missing. For more information about Charles Smith and these fascinating clocks give me a call or check out the 1989 NAWCC publication by John Anderson. There is also an article about Charles Smith in the January 1, 1944 issue of The Saturday Evening Post. This clock is in excellent, original condition. The case is solid mahogany with the original finish and there are no case damages, chips or problems. 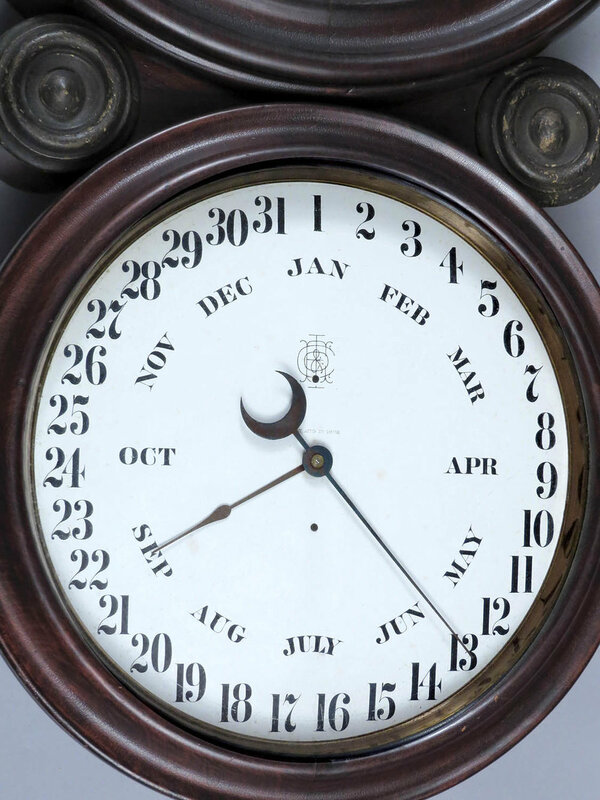 This is their “Willard” model and it shows up in their 1927 catalog with a price of $100 which represented about a one month salary at the time so purchasing this clock was not a trivial decision. Both reverse decorated glasses are done with gold leaf, are in perfect condition and there is a small pendulum view in the lower glass. 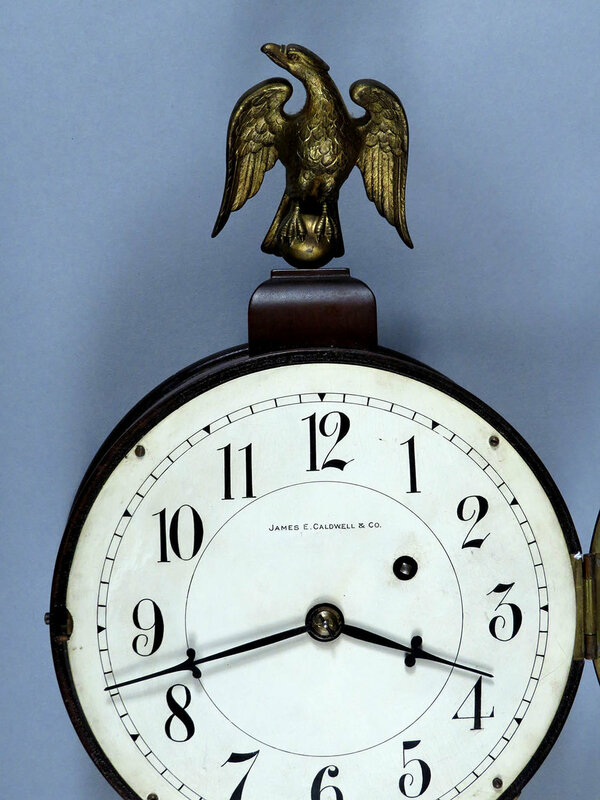 It has the original painted dial, in good condition and signed “James E. Caldwell & Co.” which was a prominent retail company in Philadelphia. This clock comes with the original hands, eagle finial, beat scale, pendulum, brass sidearms, lead weight and even the key. This is an eight-day weight driven timepiece and the movement is signed “Herschede, Cincinnati” with the crown logo and a serial number of 7510. I was not able to keep the clock running for a lengthy period of time but I have not put in a great deal of effort to discover what the issue might be. 9116 Abel Stowell & Son, Charlestown, Mass. banjo clock. This clock has had a difficult life but it is an early example and perhaps someone can appreciate it for what it is. The signature on this iron dial has worn off and there is simply a shadow left. It is extremely faint but enough remains so that I am fairly confident that Stowell is the maker. The main issue with the clock is that the lower door is a replacement. Perhaps the weight fell, knocking out the bottom board and dropping the clock off the wall. In any event, the bottom door was damaged and all that they saved were the four gilded frame strips that now form the door center section. The clock is missing the top finial and pediment along with the tin weight separator. The iron dial is the original but the numerals have been poorly overpainted. 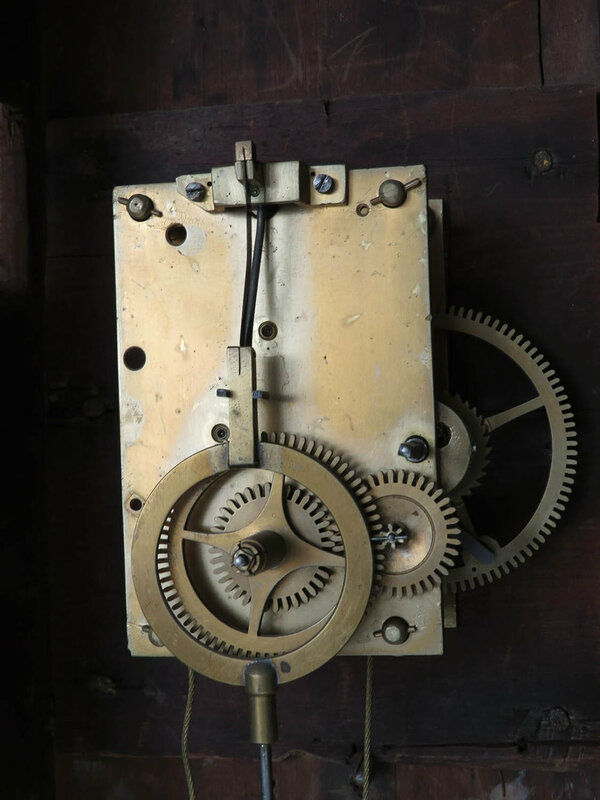 The clock does retain the original pulley, brass sidearms, lead weight, pendulum and a wonderful pair of barbed hands along with an early brass key. 9117 Waltham Willard banjo clock. At 31 inches tall, this clock is an intermediate size. It has a solid mahogany case in the original finish without any damages or problems. The main issue with the clock is that while it has both original reverse glass paintings, those paintings show a considerable amount of flaking, primarily in the cream colored background. A bust of George Washington is in the throat glass while the bottom glass has a view of Mt. Vernon. 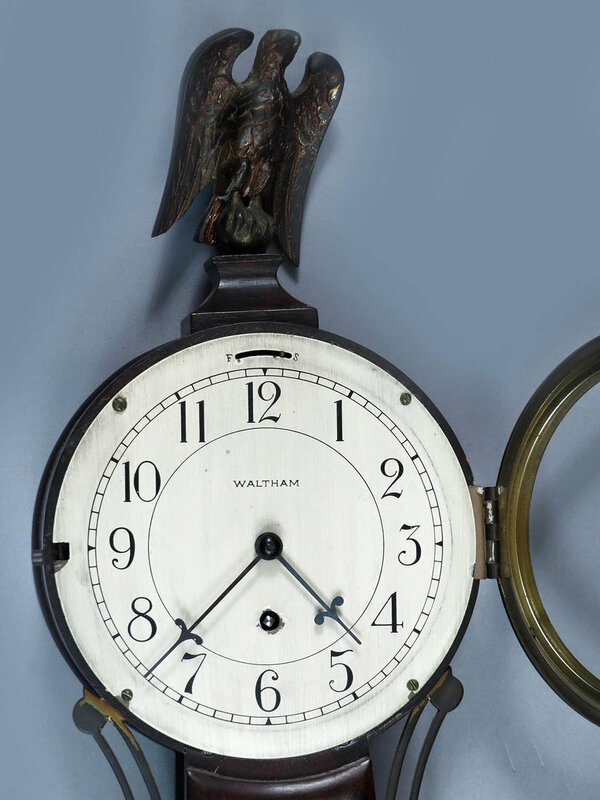 The clock retains a good, original signed dial, brass sidearms, hands and distinctive Waltham cast eagle finial. This is an eight-day timepiece with a key wound lever balance movement. It is in good running order and actually goes over nine days on a winding. 9119 Ingraham Ionic calendar clock. A large and impressive timepiece, this clock has a case of rosewood veneer and rosewood grain painted doors. The condition is much better than average. Usually this model has a great deal of veneer damage because the curved case design causes that veneer to lift but this one is quite intact. It has the original finish and a little bit of case cleaning would make the colors jump out even more. Both paper dials are original. The lower calendar dial is enclosed so the condition is just about perfect. The upper dial is exposed and it appears that someone applied a finish at one time and that finish has now yellowed and left shrinkage lines. 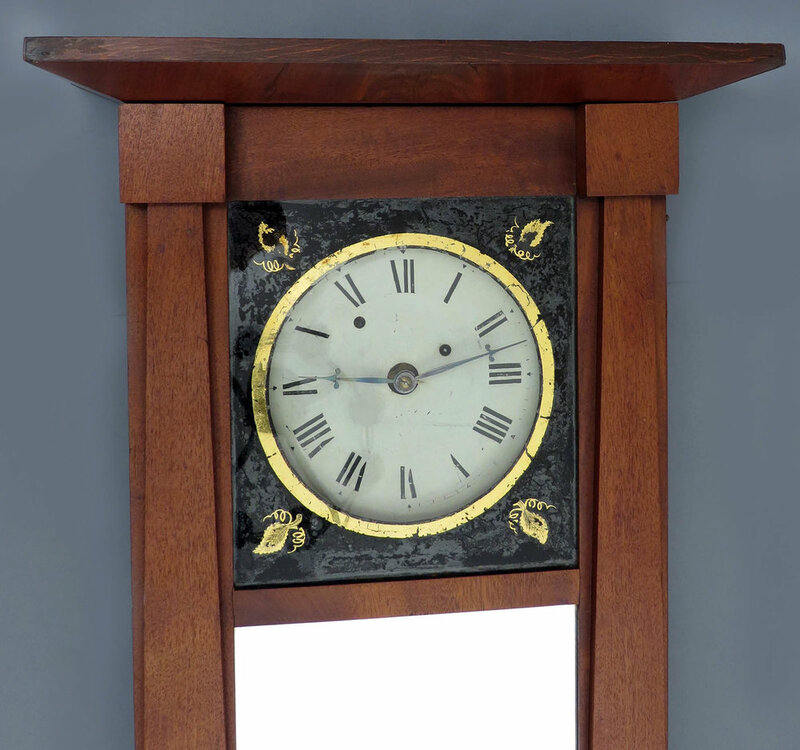 This clock retains the original hands, pendulum and those distinctive heavy solid brass hinges. It also has two good labels. This is an eight-day timepiece. It seems to be running and tripping the calendar mechanism correctly. 9120 Junghans Westminster chime wall clock. 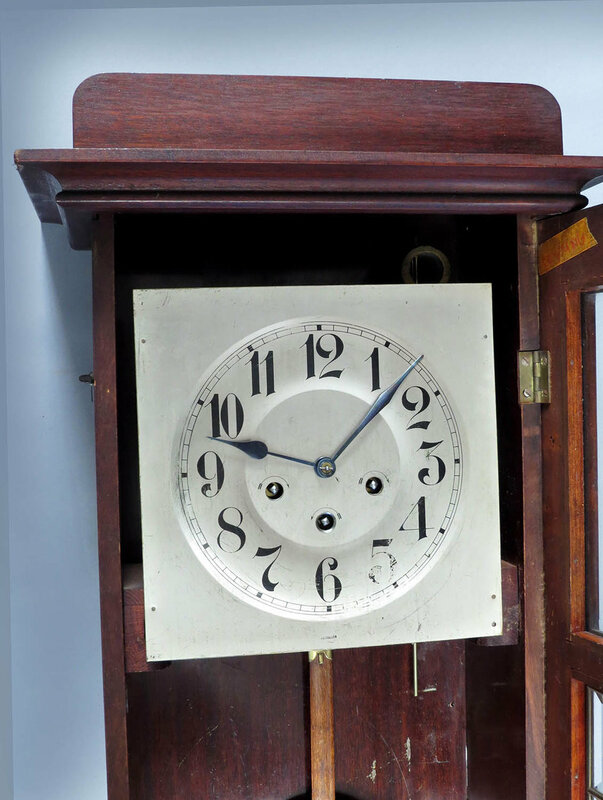 This clock has a case of solid mahogany in good condition with the original finish. It has an Arts and Crafts style look with the brass rod inlay at the top and brass framed heavy beveled glasses in the door. All the glasses are perfect without any corner chips. The dial portion of the door also has a beveled glass. It has a very good silvered dial with just a little wear at the numeral 5. It retains the original hands, key and brass pendulum. 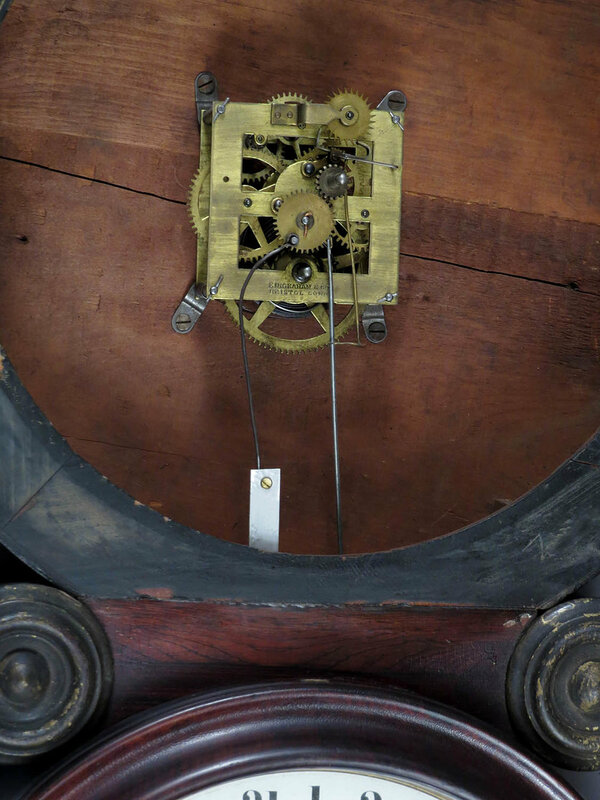 This clock has a signed eight-day movement and plays Westminster chimes on the quarter hours on 4 rods plus it strikes the hours on 3 rods. It is running but the chime sequence needs adjustment. 9121 Waterbury Halifax wall clock. This clock has a solid oak case which was refinished many years ago and now has a good patina. It is obvious that it is missing the very top portion of the crest but the rest is fine. The dial paper and pendulum have been replaced while the hands and glass are the originals. A small portion of the label remains on the back. Someone has added a brass Waterbury beat scale. It looks okay but originally these models did not have them and you could simply take it off if you wish. This is an eight-day timepiece (no strike) and it is in good running order. 9122 Seth Thomas Observer wall clock. This clock has a solid oak case with a clean original finish. The case is very nice without any chips or other issues. It has a signed dial in good condition with Art Deco style numerls. The hands, glass, heavy brass pendulum, brass beat scale and key are the originals. This is an eight-day timepiece. The movement is quite dirty and it will need cleaning to be put in good running order. 26 ½ inches tall. $175. 8058 New Hampshire mirror clock. Possibly made by Leonard W. Noyes of Nashua New Hampshire. See pages 97, 136 and 147 of Paul Foley’s Willard banjo clock book for examples with similar characteristics. The case is solid walnut and it has been nicely refinished. There are no case problems or damages. The reverse decorated gold and black upper class is the original while I believe the mirror is an old replacement. It has the original painted dial with traces remaining of a signature which I was not able to decipher. It comes with the original hands and pendulum while the lead weight is an old replacement. This is an eight day timepiece but note that it originally had an alarm which is now missing. It has been running well for me for quite some time. This case is solid oak with the dark original finish and a good looking pressed molding on the door. The only case flaw is the shrinkage line at the upper left just outside the dial. The hands, pendulum and glass are original while the dial paper is an old replacement that now has the right amount of aging. This is an 8 day timepiece. The movement is quite dirty and a cleaning will be needed to get the clock running. . This looks like a model that would have a typical English large fusee movement but it is just a standard movement with a mainspring barrel. The case has been very nicely refinished and is very clean. There are a couple of minor blemishes in the finish but overall it is very good. The lower trap door to access the pendulum is missing. The painted dial is original but you can see it has a little flaking and lifting in spots. It is signed “Made in England” and there is a bright chrome or nickel plated bezel. The hands and the pendulum are the originals. This is an eight day timepiece and it is running. 15 inches in diameter with a 12 inch dial. $65.